Let me do your nails! 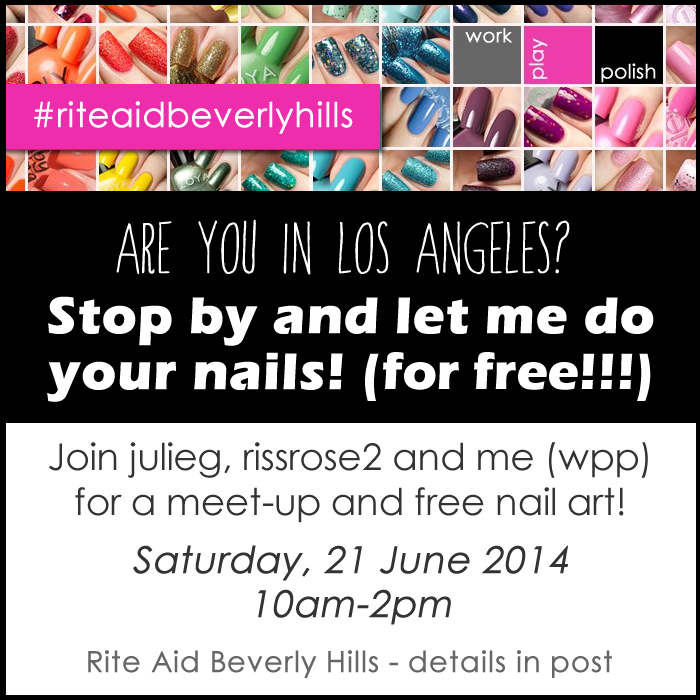 Meet me in Beverly Hills on Saturday 21 June for free nail art! I know...this is crazy (even I think it's crazy!) But Jesse's Girl Cosmetics (makers of the JulieG line) are sending me to Beverly Hills for the Rite Aid grand opening! If you're in the area, please come see me from 10am-2pm on Saturday, 21 June 2014. I'll be doing free nail art...so stop by and let me do your nails! JulieG, the vlogger behind the JulieG polish line (and the famed Frosted Gum Drops polishes which have shockingly featured my digits) and Marissa, the vlogger behind RissRose2 and RissRossDos will be there too! We'd love to meet you!